Climate scientists tell us we need to start talking about climate change. Regular folk, like you and me. We need to start talking. Conversation is at the heart of Third Coast Disrupted: Artists + Scientists on Climate.The project entails a sustained, yearlong conversation between 14 local artists and scientists centered on climate change impacts and actions happening here and now in the Chicago area. This two-way dialogue will inspire new artworks for an exhibition that will open at the Glass Curtain Gallery of Columbia College Chicago in September 2020. Through interdisciplinary reflection and artistic expression, Third Coast Disrupted aims to be an engaging way to spur public awareness of – and dialogue about – the impacts of climate change in the Chicago region. By also exploring local responses to climate change, it seeks to instill hope and be a gateway to citizen action. The artist-scientist conversation begins at a daylong retreat at Indiana Dunes National Park this September, where the participants will meet, learn about each other’s work and engage in on-the-ground field observations. Through the following year, a series of informal salons will continue the conversation, while the artists create their works. The process promises to be as rich as the outcome. Third Coast Disrupted is a multi-layered collaboration. As well as that of the artists and scientists is the partnership of the team leading the project. DePaul University environmental science and studies professor, Liam Heneghan, Ph.D., is science curator. Lisa Roberts, Ph.D., expert in museum and unconventional education, and principal of Naturalia, is art curator. And longtime environmental communications professional Christine Esposito, founder of The Ex.Change Project and Terracom, is director and co-curator. Join us on this journey to Third Coast Disrupted. Learn more about the project, and sign up to receive periodic updates as it unfolds. The exhibition opens September 8, 2020. See you there! Rising temperatures in the Midwest are projected to be the largest contributing factor to declines in U.S. agricultural productivity, with extreme heat wilting crops and posing a threat to livestock, according to a sweeping federal report on climate change released Friday. Midwest farmers will be increasingly challenged by warmer, wetter and more humid conditions from climate change, which also will lead to greater incidence of crop disease and more pests and will diminish the quality of stored grain. During the growing season, temperatures are projected to climb more in the Midwest than in any other region of the U.S., the report says. Without technological advances in agriculture, the onslaught of high-rainfall events and higher temperatures could reduce the Midwest agricultural economy to levels last seen during the economic downturn for farmers in the 1980s. Overall, yields from major U.S crops are expected to fall, the reports says. To adapt to the rising temperatures, substantial investments will be required, which will in turn will hurt farmers’ bottom lines. These are some of the findings of the report released by the National Oceanic and Atmospheric Administration. The 1,600-page report — vetted by 13 government agencies and written collectively with the help of 300 scientists — is perhaps the most authoritative and comprehensive statement on the risks of climate change, which has contributed to extreme weather that has cost the U.S. nearly $400 billion since 2015, the authors found. According to the report, the threat to Midwestern agriculture is just one potential blow to the region. BREAKING NEWS. Chicago artist Alisa Singer was asked to contribute cover art based on her Environmental Graphiti work for the major UN IPCC report released this week. The artwork below is based on a graph chosen by the IPCC. This is the first time art has been used on the cover. Here is a link to this critical report. Here is a link to a handy FAQ that summarizes the key points. See more remarkable work at Environmental Graphiti. Over the last three years, the IPAA has hired consulting firms; authorized surveys designed to “guide” pensioners into an answer the survey creators (and the IPAA) desire; employed credentialed academics to produce white papers with arguments designed to convince fiduciaries of the illegitimate aims of divestment campaigners; engaged and disseminated to willing writers and publications information and arguments to be included in editorials and articles often disguised as legitimate journalism; deployed think tanks and their employees to argue against and delegitimize the case for divestment. Having launched the above known and varied strategies for diminishing the effectiveness or outright defeating the divestment movement, the IPAA clearly intends to fund and marshal a number of companies, political operatives, and supporting organizations to derail the divestment movement before it gains further strength. Audience 1: Financial and technical arguments directed at fiduciaries and fund managers. Audience 2: Emotional, fear based arguments targeted at pensioners, and the general public, regarding future financial well-being due to divestiture. In the final pages of this paper, a case study is presented, discussing the approach of the IPAA to marshal interested groups and individuals through the Divestment Facts platform to successfully defeat the divestment campaign on the University of Denver campus.4 The methods utilized by the IPAA often mirror those outlined by Rampton and Stauber in Toxic Sludge is Good for You. As developments occur in the divestment movement, the IPAA and the public relations companies they have retained will assuredly deploy further, yet to be revealed strategies and tactics in reaction, creating obstacles and challenges for divestment campaigns. The IPAA launched http://divestmentfacts.com as a public relations project to combat the growing divestment movement on college campuses and in municipalities. Beyond the website, the IPAA has developed a Facebook presence, https://www.facebook.com/Divestment-Facts-441101512732722/, and a Twitter account, https://twitter.com/@DivestmentFacts, to further disseminate misinformation regarding the ineffectiveness of divestment in halting climate change or affecting the various fossil fuel companies bottom lines. To increase the credibility of the oil and gas producers public relations project, the IPAA has hired FTI Consulting and Compass Lexecon to conduct research and create “fact based” documents supporting their assertions that divestment is a financially losing proposition. The papers produced by the project seek to influence fiduciaries charged with maintaining the financial health of pension funds, financial management companies offering investment funds and services, foundations investing in financial instruments, and other interested parties with a responsibility to create sustainable income for various institutions. The reports listed on the project’s website outline various estimated costs of divesting from fossil fuel assets for pension funds, endowments, foundations, colleges and universities. As shall be demonstrated later in this paper, the reports created by the IPAA’s academics assert certain costs of divesting, but fail to acknowledge the risks of near- and longer-term losses to pension funds and endowments by not following the course of divestment. Divestment campaigners are working toward the goal of protecting the environment, keeping the world within the carbon budget as well as advocating for sustainable investments of universities, foundations, and federal, state, and municipal governments against the losses likely to occur due to future asset devaluations in the fossil fuel industry. China and India are rapidly transitioning to clean energy and building the manufacturing and economic powerhouses of the 21stcentury. 50 Bloomberg reported on India’s progress in December, 2017. FTI and Compass Lexecon consulting corporations are heavy hitters in the field of strategic communications. Both firms are global in scope with offices all over the world, and strategically located in capitals and important financial and business hubs throughout the U.S.
FTI and Compass Lexecon are hired to “throw” sand into the gears of the divestment movement by sowing doubt, creating inertia among decision makers, or establishing an atmosphere for decision makers to reach conclusions favorable to their client’s interests. The IPAA, FTI, and Compass Lexecon or another now unknown public relations firm will no doubt continue to activate pensioners and other stakeholders in the fight, especially to pressure fiduciaries at all levels of government to resist climate activists agitating for divestment.61 Seeking to sow doubt in fiduciaries and instill inertia, the current and forthcoming Astro-turf campaign(s) will be designed to make fiduciaries and investment managers think extensively about the risks, and eventually conclude divestment is a losing proposition for pensioners. By describing the incentive for climate activists as personal or political, such as in question 21, the survey implies a certain nebulous motivation and shallowness to the activist’s arguments for divestment along with a cavalier attitude toward the pensioners’ future welfare. While creating the survey, FTI’s writers purposely downplayed the moral arguments against the burning of fossil fuels. Never were the following questions asked: If you knew that the continued burning of fossil fuels would place the planet at risk for catastrophe, would you support a transition to a clean energy economy? Or, if you understood the continued burning of fossil fuels would imperil the planet’s habitability for your children and grandchildren, would you support the switch to wind, solar, electric vehicles and the already viable industrial infrastructure to support those technologies? And if you understood, as a consequence of the transition to clean energy technologies, the economic viability of fossil fuel assets as investments would be seriously diminished, would you support divestment of the same from your pension funds? As demonstrated, push polls can obviously be written to lead participants and elicit responses desired by the client. The FTI survey of pensioners is essentially a propaganda exercise designed to engineer public opinion and consent for, in this case, a “business as usual” environment for fossil fuel investments. Excluding pertinent questions about the long-term viability of fossil fuel investments, the survey is fundamentally specious. Yet, it is instructive. The survey reveals the strategy of the writers and the IPAA to mislead and confuse participants, and guide them to a predetermined conclusion based on fear of change. Below are 3 documents created by FTI regarding divestment. Unfortunately, the above link for the actual survey questions and results is broken. A copy is available through Chicago350. Compass Lexecon has developed a deep knowledge of the economics and institutional structures of all segments of the energy industry. We have completed numerous economic studies on issues related to competition, pricing, and the impact of regulation. Our strength lies within our teams of experts with differing backgrounds, creating extensive familiarity with domestic and global energy markets. This depth of experience, combined with our staff’s strong academic training, provides clients in business and government with high-quality analysis and high-value advice and litigation support. To design the argument against divestment, Compass Lexecon hired research and policy experts, often with highly credentialed backgrounds, to create research and analytical papers favoring the client’s desired conclusions, lending a level of credibility to their arguments. At this juncture, the academics retained to create the studies have been Dr. Bradford Cornell of California Institute of Technology, Dr. Paul Fischel, former professor at Northwestern University and University of Chicago Law School and Chairman and CEO of Compass Lexecon and Professor Hendrik Bessembinder of Arizona State University and U of Washington. Each report generated by the above academics was released within a short stretch of time: August 2015 – June 2016. Further reports by Fischel and Bessembinder were added in 2017. The white papers referenced below were created by academics associated with and employed by Compass Lexecon. Devised to depict the downsides of divestment, the documents are targeted at university endowment managers, pension fund fiduciaries, and financial managers. DIVESTMENT FROM FOSSIL FUELS IS A COSTLY, INEFFECTIVE STRATEGY. The reports cited above are heavy in financial jargon, discussing ideas such as frictional costs, risk adjusted shortfall, absolute return asset classes, etc.. They are aimed at fiduciaries with the duty to examine and analyze financial investment options for institutions. Each paper seeks to examine the costs associated with divestment and are submitted to fiduciaries in order to persuade them of the financial hazards of following the course of divestment. Below are some key quotes from the reports produced by the academics and employees of Compass Lexecon and the IPAA. Basically, Bessembinder advocates a policy of everyone holding on to fossil fuel assets to maintain the overall values for all investors. Essentially espousing a house of cards argument, Bessembinder admits the overall fossil fuel market is so structurally fragile that the wolfish winds of divestment threaten the collapse of the entire edifice. He contends, if institutions begin to sell, then the values of endowments will be diminished as institutions leave the market for these assets. This seems like an absurd argument for maintaining such investments. If fossil fuel stocks and bonds will become eventually worthless due to the changing landscape of the energy sector and making those changes is required to avoid the worst planetary habitability outcomes for humans due to climate change, why would he advise the holders of such assets to retain them in their endowments or pension funds? The endowments and/or pension funds would suffer financial losses anyway once the bottom drops out of the market, leaving the holders of those assets with the losses. It seems Bessembinder and the oil producers paying him through Compass Lexecon want the institutional investors to take the hit at the end of the fossil fuel era rather than cutting losses while asset prices still have some value. And, as institutional investors typically have monies placed in difficult to unwind financial instruments, the investors would be less able to quickly shift out of the fossil fuel assets once the fossil fuel bubble bursts. Beyond the house of cards argument, the author basically has created dazzlingly jargon- rich claims of losses due to “Frictional Costs” of divesting. While his assertions may have mathematical validity, his contentions are basically a distraction and an attempt to have fiduciaries become lost in a maze of numbers. He never addresses a key fact regarding the future of fossil fuel utilization for transportation and power generation. The fossil fuel era will come to a close and probably sooner than the oil and gas industry would like to believe. So, while Bessembinder advocates fiduciaries pay attention to the minutiae of minor losses, he mimics a ship captain at sea who sees the tip of the iceberg bobbing above the surface and shouts down at the crew, Oh that. That’s just a little bit of ice. No problem. Full speed ahead! Keep pouring fuel into the engines! Bessembinder, due to his position as hireling for the IPAA, ignores the larger financial risk of maintaining financial investments in fossil fuels for the imprudent diversion of statistics of the moment. He would have fiduciaries discount the abiding duty of managing a fleet of investments designed to bear returns in perpetuity for the fear of losing in the short-term by selling assets. Ceaselessly maintaining investments in fossil fuels is the equivalent of sighting the iceberg at a distant, holding course and slamming the ship into the hidden vastness beneath the surface, and then being astonished as the vessel begins to take on water. For the planet to be a sustainable habitat for future generations, reliance on fossil fuels will need to be greatly reduced. Indeed, fossil fuels must be essentially eliminated as an option for powering industry, transportation, and every aspect of the built environment. At the forefront, environmental activists and conscientious politicians understand the dangers of maintaining modern society’s current addiction to fossil fuels. The general public does not lag far behind. As previously cited in this document, reports from Morgan Stanley, Goldman Sachs, the Grantham Institute, HSBC, Lazard, Bloomberg New Energy Finance and countless others all reach the same conclusion: The Renewable Energy economy will disrupt the fossil fuel economy. The only question is How quickly? Again, the problem with this analysis is Fischel’s focus on past performance. While other investment specialists at MSCI, Impax Mgmt., and the Aperio group have conducted similar historical analyses with results arguing for minimal losses, break even, or advantageous results following divestment, Fischel does not account for the highly likelihood of future of losses incurred by the bursting of the carbon bubble and stranding of assets.92,93, 94 He does not acknowledge the imperative of societies to abandon fossil fuels and the shift already occurring. Fischel does not raise the concept of the eventual displacement of coal, oil, and gas in power generation and transportation, because the topic does not fit into the oil industry’s prerogative of maintaining their business model and profits. He is being paid by the IPAA to create the argument and results desired by his paymasters. In his more extensive paper, I searched the terms “carbon bubble” and “stranded assets.” The search yielded no reference to either of them. Moreover, as illustrated by the IPAA creating the Divestment Facts website, the oil and gas industry demonstrate their apprehension of losing the PR fight regarding their business model. With the lasting effects of their out-dated model being destructive emissions of CO2, the IPAA and the oil and gas industry at large dread the moment the general public realizes that the damaging consequences of their business outweighs any further benefit. If the industry actually perceived the divestment movement as harmless and replete with “empty gestures,” the IPAA would not have considered it necessary to invest in the PR battle and seek to alter stakeholders thinking on their activities. As one aspect of an overall strategy to decarbonize the energy and transportation system, the divestment fight has indeed inflicted damage on the reputation of the oil, coal and gas industry. In conjunction with environmental movements seeking to move toward clean energy, the divestment movement complements campaigns such as the Sierra Club’s 100% renewable campaign and Food and Water Watch’s support of U.S. Representatives Tulsi Gabbard’s sponsorship of the Off Fossil Fuels (OFF) Act. The above statement is an absurdity. Basically, it maintains a fiction, stating, if we as a society are using a set of energy producing technologies and fuels for transportation today, we cannot advocate for a different energy infrastructure for power generation and transportation for tomorrow. His argument promotes a type of static and erroneous thinking about societies. Civilizations constantly evolve and shift, performing a continual dynamism of becoming. His thinking resembles the comical arguments asserted by industries opposed to the shift from horse drawn carriages to automobiles in the early 20th century. Keep buying those buggy whips boys! Utilizing the energy structures available today, structures created long before most of us were born, does not compel us to keep using them, even if we have been complicit in maintaining them through behavior directed by those existing structures. A past record of using petroleum and gasoline for transportation, coal for power generation, and natural gas for home heating and power generation does not mean we shouldn’t advocate for an energy infrastructure of tomorrow—Solar PV, On-Shore and Off-Shore Wind, EV’s, LED’s, etc.. As citizens, we deserve and should demand a different energy infrastructure to maintain a habitable planet and produce an overall cleaner environment. Changing course is the only moral imperative. Besides the implication of societal regression and a Hobbesian dystopia of life lived “solitary, poor, nasty, brutish and short”,101the false premise implies a dearth of alternative methods for generating electricity to manufacture products and meet basic needs. Furthermore, the question was devised to help respondents rationalize their resistance to change. The overall survey was an elaborate push poll with the objective of steering the respondent through an emotional landscape, suggesting a back sliding from modernity and the comforts of modern life. One of FTI’s strategies listed on their website is to reach out to “key influencers” to persuade the public. One wonders if Victor Carroll is part of FTI’s “broad network of relationships,” among the “key influencers” the corporation pays to craft the façade of a wide spectrum of opposition to divestment. The only linkages currently apparent are the similarity of talking points. One of the chief tactics public relations firms employ is the illusion of undirected opposition. In other words, they promote the perception in the public of grass-roots resistance springing forth spontaneously and without prompting. The hired operatives present themselves as individuals and interest groups fighting for or against a public policy but actually testify or protest in the interests of an affected industry. The operative’s job is to contribute to an Astro-turf campaign to influence policy makers and the public and make it appear completely organic and home grown. In Rampton and Staubers, Toxic Sludge is Good for You, the writers outlined this industry tactic thoroughly, and the basic strategy is employed by public relations firms today. In opposition to DU Divest, the groups and individuals were organized and activated by the IPAA while the IPAA itself downplayed their role in the oppositions activities, especially during presentations and argumentation before the University of Denver’s officials as illustrated in the forthcoming pages. In the age of the Internet, disguising Astro-turf organizing and campaigns proves far more difficult. Yet, individuals lacking knowledge of public relations strategies and tactics might be easily fooled by newspaper editorials, rallies supporting industry objectives, and think tank and academic papers paid for by the industry. Each stratagem is designed to slickly deflect from the real issues confronting citizens, especially the damage done to their lives and well-being by the continued burning of fossil fuels. So, while the Astro-turf organizing efforts of industry have become more transparent, the overall strategy and tactics originally outlined by Rampton and Stauber remain effective nearly thirty years later. Here is the link to the Divestment Facts webpage announcing it to their readership. On the YouTube site, the IPAA is never mentioned as the producer of the video and many of the claims made in the video are specious. Firstly, the propaganda piece asserts the activists are against energy in general. Only once is the term fossil fuels mentioned. Anyone even remotely familiar with 350.org and the divestiture movement understands the ultimate goal of activists is to have the energy, heating, and transportation sectors transition from dirty energy to clean renewable sources. 350.org and affiliated groups seek to inform the public of the destructive habits and actions of an industry resolved to prioritize profits, greed, and the resultant destruction of ecosystems over the continued habitability of the planet for the current range of biodiversity, including humans. Once the American public understands the full stakes of continuing the fossil fuel era, the oil, gas, and coal industry will be seen as unacceptable and their old business models will be comprehended as spurious. Having created the Divestment Facts platform as a propaganda outlet, the IPAA and allies desperately fight the inevitable discrediting and demise of their industry. As a matter of fact, the industry makes great effort to combat the stigmatization. The IPAA and their allies understand public perception is paramount to maintaining their stranglehold over the energy sector. The fossil fuel industry writ large comprehends the battle before them. When the public fully appreciates the breadth of destruction the continued burning of fossil fuels entails, the game is over. The American public and their representatives will grow prohibitively hostile and force the transition to clean energy while destroying the industry’s ability to operate and produce profits for shareholders. Throughout the IPAA’s Divestment Facts website, the oil and gas industry continually attempt to discredit their opponents. Nearly all of their blog posts stress this issue. Positive public perception of their industry is their life blood. The fossil fuel industry fears the loss of public approval more than anything. Losing consent to operate means the end of traditional energy. Beyond advocating for 19thand 20thcentury fuels in the video, the narration falsely claims universities divesting from fossil fuels would need to remove funds from all industries remotely connected to current fossil fuel production activities. While the oil and gas industry understand this to be a lie, the divestment movements actually request endowments, municipalities, and pension funds sell off financial assets connected to the top 200 fossil fuel companies, ranked by the amount of Proven Fossil Fuel Reserves on their balance sheets. 102 The fossil fuel industry utilizes this spurious line of argumentation in an attempt to depict the divestment movement as confused and unreasonable, lacking a cogent and cohesive argument, and therefore illegitimate and dangerous to modern standards of living. And, as institutional investors typically require more time to unwind investments, the process of divesting should begin now and in earnest. Below is a series of links to blog posts regarding the DU divestment battle. It shows the amount of close monitoring and direction of the situation by Divestment Facts and the IPAA. As of January 24th, 2017, the University of Denver’s Board of Trustees has rejected divestment. Below is the blog post from Divestment Facts. Simon Lomax of Independence Institute (Koch supported think tank) and now with Divestment facts. In 350’s efforts to have cities and states divest operating budgets and pension funds from fossil fuel stocks and bonds, we expected and have seen a similar opposition form, including various individuals and groups fashioned together into a coalition by the IPAA, the American Petroleum Institute or other industry trade organizations and lobbyists. 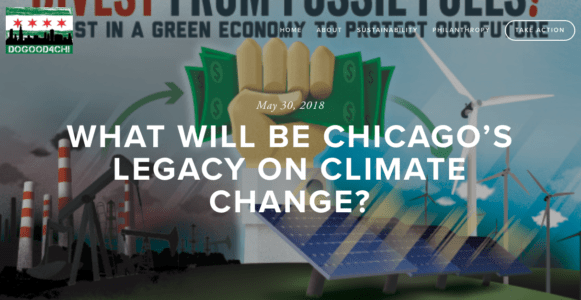 In Chicago350’s efforts to have the city of Chicago divest pension funds and the operating budget, the known opposition has mainly arisen from the Building Trades. Many of the member unions of the 25-union organization maintain occupations in the fossil fuel industry. The leadership of the Building Trades still falsely believe the environmental movement in general and divestment actions in specific belong in the realm of social issues. At this time, the Building Trades have yet to comprehend the dire financial risk of maintaining investments in the fossil fuel sector. While the Trade Unions understand the market share for renewable energy is growing, they do not yet feel the radical shift happening and the rapidity in the transformation of the power generation and transportation sectors. Unfortunately, history has shown many incumbent technologies prove obsolete sooner than thought and workers involved in the production or delivery of older technologies often bear the financial brunt of the outmoded technologies demise.111, 112 The earth shifts beneath their feet and those workers only peer downward at the open air shortly before plunging into unemployment and the ensuing uncertainty of future financial prospects. In conclusion, the IPAA and the organizations and individuals employed and deployed by the oil industry trade group will continue to fight rear guard actions against the divestment movement. With the forthcoming demise of the fossil fuel industry due to the required and inevitable shift to clean energy technology, the IPAA and the fossil fuel industry will collectively seek to delay the transition through a number of means, typically by public relations campaigns to dismiss newer technologies as insufficient and opposition groups as fringe and out of touch with mainstream society. Secondly, the industry will attempt to solidify their current position via electoral campaign activities, especially through the legalized bribery of financial contributions to candidates, purchasing the legislating power of political votes. In the end, the fossil fuel industry’s efforts will fail, but the determinative questions remain: How long will it take? How much will it cost? And will it be too late to save the habitability of the planet? For the environmental movement, the challenge requires organizing and mobilizing coalitions of resistance, exposing the industries tactics, and building voting power while the clean energy industry further establishes beachheads in the power generation, home heating and transportation sectors. In this appendix, I have included many of the web pages connected to Divestment Facts. Closing out the appendix are links to several articles written in opposition to fossil fuel divestment. Many of the talking points in each article reflect those enumerated on DivestmentFacts.com. Film. Happening: A Clean Energy Revolution. March 6. One Earth Film Festival Group Outing! Film at 7:30 to 9:30 p.m.
OEFF After Hours Event. Doors open at 7 p.m., when you can relax with a drink and light appetizers in a chic and urban space. After the films, unpack what you’ve learned about clean energy with Jamie Ponce of the Environmental Law & Policy Center, Craig Sieben of Sieben Energy Associates and Reverend Booker Steven Vance of Faith in Place. Facilitator: Stephanie McCray Executive Coach, Executive Material. Doors open 15 minutes before start time. Arrive early to avoid lines and get best seats. CHICAGO-AREA PREMIERE. FILM DESCRIPTION: When the issue of renewable energy comes up, it’s common to think, “that’s a future thing. It’s like sci-fi.” Well, this film is here to tell you, the clean energy revolution is happening right now. Director James Redford, an award-winning filmmaker … and, yes, Hollywood legend Robert Redford’s son … takes us on his personal journey into the dawn of the clean energy era as it creates jobs, turns profits, and makes communities stronger and healthier. “Reaching well beyond a story of technology and innovation, Happening explores issues of human resilience, social justice, embracing the future, and finding hope for our survival,” says Redford. THE LOCAL SPIN: As the State of Illinois is poised to implement funding and resources through the Future Energy Jobs Act of 2017, we have our own clean energy and social equity ideas and stories to explore.